During the fall of 2013, I was mentally struggling to feel good about myself – from my appearance to my academic abilities – and I wasn’t exercising or watching what I was eating. By the end of 2013, I was the heaviest I’d ever been, at 202 pounds, and the weakest I’d ever been in terms of muscle. I decided with the start of a new year would come a new me, mentally and physically, and made it my New Year’s resolution to drop at least 30 pounds. 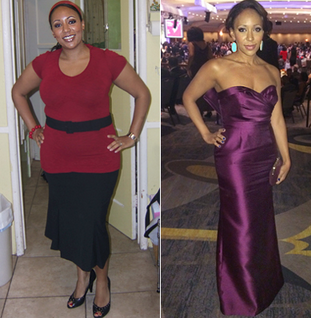 I began my fitness journey on January 13, 2014, when I joined a transformation challenge on zxtofficial.org. I started weightlifting about five times a week with some guidance from various articles and programs as a part of the challenge. I stopped eating fast food and started preparing healthier meals ahead of time. I also started blogging about my journey to physical fitness and mental health on my website, vowing to be transparent about the ups and downs of the whole process. It helped me feel extra accountable for my actions. My biggest challenge was realizing that progress, no matter how slow or small, was still progress and celebrating myself accordingly. The best thing I could’ve done for myself was blog about my journey because every time I wanted to give up, I simply wrote about it. I wrote about how hard it was, how crappy I felt, how I hadn’t been in the gym for weeks, how I hadn’t been eating well, how I was mentally struggling to feel good about myself and so on. I’d publish my posts on social media and people would message me saying how grateful they were for my honesty, and how they could relate and felt inspired. Their likes, comments, and messages motivated and inspired me to continue my journey. To be honest, I tried not to focus on the number on the scale too much. If in the gym I’m getting stronger and lifting more weight and my clothes are fitting better, that number on the scale could even go up a little and it wouldn’t be a bad thing. Whenever my fat loss hit a plateau, I’d incorporate some HIIT (High Intensity Interval Training). What I love about my daily diet is that it doesn’t look that similar on a daily basis because I eat according to IIFYM (If It Fits Your Macros) or flexible dieting. My current macros are about 50 grams of fat, 125 grams of protein, and 150 grams of carbs. I track whatever I eat on the Lose It app and by the end of the day I try to hit these numbers with the foods I have eaten. I like incorporating protein into my breakfast, lunch, and dinner in the form of egg substitutes, honey smoked turkey slices, grilled chicken, and whey protein. This may sound strange, but I like mixing my protein powder with ½ cup of low-fat ice cream. It always fits my macros and tastes delicious. It’s definitely been a mental journey as much as it’s been a physical one. I’ve learned that life isn’t guaranteed and no matter what size you are, you truly have to love yourself no matter how you look. I may have lost weight, but my legs are still big. I used to hate having big legs and would wish for them to be skinny. Now, I love that they’re big and strong! I’ve learned to embrace my build and work to make the body that I have healthy and strong. Through blogging about my journey, I’ve also been able to share my experience with many others who have in turn shared their struggles and gratitude with me. I have no words for how much these people have impacted my life and made me want to keep doing what I’m doing and keep on writing. It’s okay to have bad days and to not be perfect. It’s okay for the progress to be slow. The most important thing you can do is never give up. I know that sounds incredibly cliché, but it’s true. Even when I had bad days or weeks and I was steering off track, I never thought, “This is it. I give up. It’s over.” Instead, I thought, “This is a bump. Once it’s over, I’m back on track.” If it helps to tell friends or family that you’re on a fitness journey for accountability purposes then do it! That’s how my blog started and it’s helped me stay on track. But trust me, if you want to change your life, your mind, and your health for the better, you can definitely do it! What was the turning point that prompted you to lose weight? One day, at the age of 41, I walked past a mirror and thought, “I do not recognize myself anymore.” My healthy and happy self was trapped inside of a body that I wanted out of. When did you start trying to lose weight? The first time I remember trying to lose weight was in junior high. I was able to slim down by drinking weight-loss shakes or skipping meals. 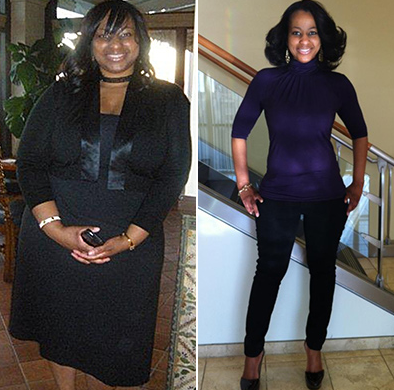 However, I soon gained the weight back plus more – by my mid-twenties, I was up to 260 pounds. 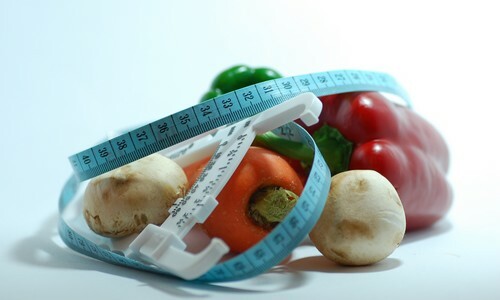 I would try to lose 10 pounds for an event by using fad diets (lemonade cleanse, cabbage soup, or no-carb diets), but I would always gain the weight back right after the event. In August 2011, I decided to try again and not give up this time. I realized that losing and maintaining weight is a lifestyle change, not just a temporary diet. How did you get started? I decided to not go on another fad diet and instead educated myself on proper nutrition. I also decided that instead of staying in the office on my lunch break, I would get up and take a nice walk. At first, I could only walk for a block or two before feeling out of breath. By April 2013, I completed a 5k walk for autism! What was your biggest challenge? Portion control. In the past I would eat until I was really full and didn’t pay attention to how many calories I was consuming. Learning proper portion control and keeping a list of how many calories I was eating each day played a big part in my weight loss. Were there any times when you wanted to quit or give up? How did you stay motivated? I wanted to give up almost every day for the first month or two! My sugar cravings were pretty hard to overcome at the beginning. Every day I would have sugar withdrawals. At first I didn’t know what to do; I would have a piece of hard candy to help. But I quickly learned that a healthy snack like an apple with a small amount of peanut butter worked perfect. When I wanted to give up, I thought about how many times I had given up in the past and knew that I did not want to give up again. If you reached a weight loss plateau, how did you break out of the rut? I would take longer walks or change my calorie intake. If I adjusted my calorie intake, I would make sure I did not go below the amount recommended for my height and current weight. What’s your current exercise routine? I enjoy walking and jogging. I continue to walk on my lunch break or after work. On weekends I walk and jog. I would love to start taking Zumba classes. What’s your daily diet look like? I love a high-protein breakfast (egg whites and lean meat) and a granola bar for my morning snack. For lunch I usually have a salad or a hearty soup. Greek yogurt and fruit is my favorite afternoon snack. Lean meat and veggies with a small amount of steamed rice or a baked potato is always a nice and easy dinner. I also make over my favorite recipes into healthier ones that I can cook at home. What’s your favorite healthy snack and meal? My favorite snack is a KIND bar, and I love Cajun food; my family is from Baton Rouge, Louisiana. How has losing weight changed your life? 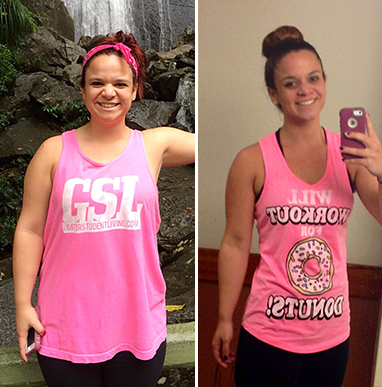 It changed everything – from being able to breathe better to feeling better about myself. Because of my unhealthy weight and poor eating habits, I was placed on blood-pressure and heart-rate medication. As I lost the weight, the medicine was decreased and as of today, I’m off both medicines! 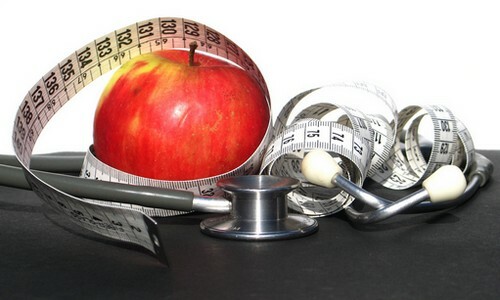 Do you have any advice for those trying to lose weight? Yes! It does not matter how many times you have failed before, you only have to be successful once. Maintaining, however, is something you have to do for a lifetime – but success and happiness are much sweeter than any cupcake! I became unhappy with my weight when I realized that I didn't feel healthy, I was 2 pounds away from my highest pregnancy weight and I had a 10 pound baby! I could not fit into my cute clothes anymore. I was in a size 16 top and 14 pants and could wear clothes in the plus size stores (I used to wear petites). I was having chest pains and I was frequently tired. I also became winded after walking upstairs. My doctor told me that I was obese because my BMI was over a 32. I was also diagnosed with high cholesterol and diabetes, and she wanted me to take medication. I told her I wanted to try it naturally and she was skeptical about my ability to change my lifestyle. I was DONE. I counted calories and started eating MUCH cleaner incorporating fiber, fruits, veggies, lean proteins and more water into my diet. I also cut out fried foods, red meat, pork, candy, cookies, brownies and anything with excessive amounts of sugar, fat or sodium. I also started exercising 3-5 days per week. The hardest thing for me has been resisting temptation from the foods and drinks I used to enjoy SO MUCH and control my portions. I have researched alternatives to them and it has worked pretty well! I thank my faith in God for helping me be strong. It took about 3 months before I saw obvious changes in my body, although other people could tell before that point. I am still working on it. Currently, I make sure to watch what I eat and exercise and used Bee Pollen For Weight Loss .I am 16 pounds away from my target weight goal! I have so much more confidence and feel so much better! My blood sugar is under control and my bad cholesterol is lower than it was in January. I am now 2 clothing sizes smaller than I was 8 months ago. What was the turning point that prompted you to lose weight? I had just had my daughter and gained 40 pounds during the pregnancy. I was desperate to go back to work in my pre-baby clothes. I didn’t give myself any outs or excuses. I was determined! When did you start trying to lose weight? Technically, when I was eight years old. I have a long history of struggling with my weight. But the most recent time — when I really made a permanent lifestyle change — began three years ago in January 2012. How did you get started? I hadn’t been cleared for exercise by my doctor, so I just started by cleaning up my diet. I eliminated all of my trigger foods, including flour, dairy, candy, and wine. It was excruciating! But I was committed to doing it for 40 days and I made it through. After that, my habits and tastes had changed, so I kept going. Cleaning up my diet was the single biggest factor in my change to a healthy lifestyle. I lost 50 pounds before I started exercising! What was your biggest challenge? Staying away from my trigger foods. Those things are like a drug for me and kicking the habit was like going through detox. Were there any times when you wanted to quit or give up? How did you stay motivated? Absolutely. I wanted to give up on many occasions. And there were times I had big setbacks. Two things kept me going. One was my faith. I prayed a lot and I knew that God wanted me to be healthier. The other thing was knowing that I’d never reach my goals if I gave up. I just had to keep going. Persistence is victory. If you reached a weight loss plateau, how did you break out of the rut? I reached a major plateau and couldn’t shake the last four pounds before reaching my goal. I stayed there for about a year. A year! I broke through by upping my cardio big time, while really refining my diet. I realized I’d gotten sloppy and lazy on a lot of things. What’s your current exercise routine? I work out every single day; sometimes twice a day. I love it. It’s the most fun I have all day. I do SoulCycle, Barry’s Bootcamp, Yoga, and barre classes. I need classes; if I work out on my own I don’t get much done. What’s your daily diet look like? Before I exercise I have a spoonful of peanut butter and half a banana. Immediately afterwards I eat the other half of the banana. About an hour later – once I’ve showered and dressed – I eat a big breakfast: egg whites, chicken sausage, sweet potato, and oatmeal. Lunch and dinner are about the same, usually a piece of fish or chicken, veggies, and some brown rice or quinoa. If I need a snack, I’ll have some nuts or fruit. What’s your favorite healthy snack and meal? Oatmeal with caramelized bananas (I sauté them in a non-stick pan) with pecans and agave. Yum! My favorite meal is roasted chicken with broccoli and mashed sweet potato. How has losing weight changed your life? It has changed everything, from the amount of energy I have, to how I feel after I eat, to how I cope with stress. If you would’ve asked me before I lost the weight, I would have said that wearing a size 6 was going to be the best part. But now, I realize it’s so much bigger and better than that. 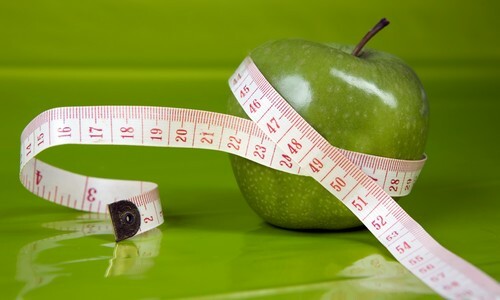 Do you have any advice for those trying to lose weight? Set small goals. Don’t try to lose 50 pounds. Start with five. The journey of 1,000 miles begins with a single step.